Ithala Game Reserve is a 29 653-hectare scenic destination and is considered a game viewer’s paradise. It is situated within the rugged and mountainous thornveld about 400 km north of Durban, in northern KwaZulu-Natal. Being proclaimed as a nature reserve in 1973, it is one of the youngest game reserves in South Africa. Ithala Game Reserve’s most admirable characteristic is its astonishing geological diversity which has resulted in the production of a variety of soils and a rich diversity of vegetation. The reserve encompasses densely vegetated river valleys, high-lying grassland plateaus, mountain ridges and cliff faces. The altitude varies from 400 m along the Phongolo River to 1,450 m along the Ngotshe Mountain escarpment. This game reserve was the setting of many historic events in South Africa, including the reign of Shaka and his successive Zulu kings. Evidence of earlier occupation by middle stone age and iron age people can be seen. Ithala also features some rock formations dating back 3 000 million years and some historic sites wherein stone age spear and ax heads dating back some 20,000 years are found. Ithala Game Reserve is also home to a wide array of wildlife species including giraffe, rhino, elephant, buffalo, zebra, blue wildebeest, impala and a wide variety of antelope including tsessebe, eland, red hartebeest and mountain reedbuck. Visitors will surely enjoy observing all the animals and plants and listening to the sound of chirping birds in the wild. Ithala Game Reserve does not only offer a fascinating variety of terrain, history and rich wildlife, it also offers a wide selection of tourist facilities and a variety of game activities such as ranger-guided walks, game drives, swimming, and picnics. It also offers an excellent auto trail. Visitors are welcome to try out the mountain bike trails. Ithala has a number of well laid out auto trails with markers at points of interest. The Ithala Game Reserve Auto Trail is a self-drive rocky mountain track with river crossings. Auto Trails consist of a 30 km circular drive that should take about three hours to complete. These Auto Trails gives the guests the opportunity to experience the African wildlife and fauna of Ithala Game Reserve from the comfort of their own vehicle. Booking beforehand is essential because only three vehicles are allowed at one time. Ithala has a number of routes for walking trails. These walking trails provide a great way to get close to the magnificent flora, fauna, and avifauna of the reserve. Guided trails depart in the early morning and mid to late afternoon depending on the season. Guests can also enjoy the independence of self-guided walking trails. Day and night drives are conducted in open viewing vehicles and are a popular tourist attraction in the reserve. No safari is ever complete without an exciting day game drive. A night game drive is a great way to experience the romance of an African sunset as well as to see nocturnal animals with the help of a spotlight. These game drives are the perfect way to discover the flourishing wildlife of Ithala Game Reserve. Game drives are conducted in state of the art safari vehicles in the presence of an expertly trained ranger and tracker. Picnic sites are situated in several scenic spots of Ithala Game Reserve which offer spectacular views and are ideal for game watching. These picnic spots also have barbecue facilities and ablutions. The interesting history, fascinating geological formations, the astonishing range of landscapes, wide array of wildlife, various activities, scenic beauty, and remoteness makes Ithala Games Reserve one of South Africa’s most sought-after safari destinations. The DumaZulu Traditional Village which is located in Hluhluwe, Zululand, KwaZulu Natal offers a different kind of experience for its vacationers. Situated in the heart of rich cultures of Africa, lies a beautiful village that will give you an insight on how they thrive as a village. The DumaZulu Traditional Village prides itself as a place not only to stay and dine but also of a place full of unforgettable experiences. DumaZulu directly translates to “Thundering Zulu” which is a perfect description for this place offers such scenic view and exciting events. It has 21 rounded ethnic huts arranged in a circle around a central cattle traditional African village to resemble the traditional Zulu Village. Experience the traditional KwaZulu Natal culture and hospitality in each hut housing twin rooms and double rooms which includes en-suite bathroom, air conditioning, telephone and tea/coffee making facilities. 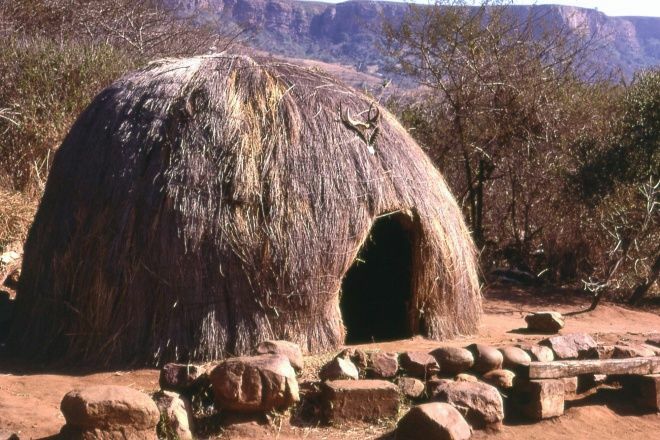 The exteriors of each living space represent the variety of vast South African tribes such as the Zulu, Swazi, North Sotho, Xhosa, Venda, Tsonga, and Ndebele. The extravagant exteriors represent the warm and intimate colors of Africa. As its interior and exterior gave you a glimpse of what is their culture, the main event here is really the village life. Discover the Zulu way of life in their cultural village which 60 Zulu residents form part of their living museums. Witness the villagers showing off their craftsman skills by making spears and shields. They also make clay pots, intricate beadwork, and basket weaving. Be also amazed by the magic of the sangoma or the witch doctor of the tribe that would show his skills and prayers. They also showcase bone-throwing and amazing Zulu dances that culminates the cultural experience of the Zulu tribe. These showcasing of tradition and culture typically performed daily at 8:15 and 15:15. After you enjoy these shows you will be treated to its famous and scrumptious lunch that you will surely come back for more. In addition, you can also taste their Zulu beer as one of their famous attractions. At this point, you, will already experience their culture and be amazed at what these people have to offer. In addition to the village tour offered by the DumaZulu Village is another attraction which is the Bird and reptile park. This park is for the adventurous and for the curious. The park has a vast variety of snakes such as Black mamba, Green mamba, Forest Cobra, Boomslang, Python and others just to name a few. You can also observe different species of birds in their natural habitat. The DumaZulu Lodge also offers other different activities and not just the DumaZulu cultural experience. The DumaZulu village is situated in a reserve that is perfect for a bush walk and game drives. Thus, you can also marvel on their Game Drives in open vehicles. And upon request, you can go snorkeling or scuba diving in the pristine Sodwana Bay. Or go fishing trips in the Sodwana Bay. You can also go whale watching or have an exclusive boat cruise on neighboring property all upon request. Overall, if you are looking for a different kind of vacation, one that you can truly enjoy and learn from and lets you immerse in its culture, then go to the DumaZulu village and lodge. This place is more than just a place to stay in. It is a village of people and tradition, thriving and marveling in their awesome and authentic culture. Learning not only from their tradition and language but also their spirit and culture. You will surely fall in love with the many experiences it has to offer and might treat this as your second home. St Lucia Marine Reserve is located in South Africa, on the East Coast of KwaZulu-Natal. This is a beautiful location, one of the protected areas of South Africa, with many natural ecosystems. It is managed by the iSimangaliso Authority and contains many different places that you can go. Some of these include Lake St. Lucia, False Bay Park and also Cape Vidal. This is one of the more popular destinations in this region of South Africa, despite being somewhat isolated in comparison to other popular destinations. Here is a quick overview of this region, and why you should go fishing at Cape Vidal. Greater St Lucia Wetland Park is one of those unique places in the world that has great beaches and prolific wildlife. Even the coastline has a wide assortment of unique marine life. Cape Vidal is a location where people can do many things including swim, go boating, and snorkeling. It is also a popular destination for those that like to go fishing, a place that both novices and experts will have access to beautiful fish that they can catch every day. There are a few things that you should know before you decide to go fishing in this area of South Africa. First of all, it is a region where malaria can be contracted. You need to take the proper medical precautions before you arrive, and also be aware that endangered species such as the leatherback and loggerhead turtles come to these areas in order to the eggs to perpetuate their species. Finally, you need to be prepared for the different types of fish that you will have access you decide to go fishing at this location. The fish are quite large including sailfish and marlon which can range from a couple hundred pounds to nearly 2 tons, respectively. This type of fishing requires not only special fishing equipment, but you will probably need to work with local fishermen that can take you out to spots where the fishing is good. In the same way that you can get guides to take you on trails so that you can see some of the larger land animals including crocodiles, hippos and buffalo, a guided tour into the deeper waters is always recommended. Once you have decided to take a trip down to South Africa to go fishing in this region, you need to choose the best time to go. It is open to the public during the months of October through March, between the hours of 5 AM and 7 PM at night. You can go in the winter months which are between April and September, and no late entry is ever permitted. There will be a nominal entrance fee to get in, and it is recommended that you stay in minimum of four or five days so that you can take advantage of not only the fishing, but all of the other attractions that are in the area. Once you have decided to head down to Cape that all to do some deep-sea fishing, it is a trip that you will definitely appreciate once you arrive. When you take a break, you can always take advantage of self-guided trails, basking in the sun and the beaches, or simply relaxing in this beautiful South African Paradise. Plan your trip today to travel during the peak season, and you will definitely have a fantastic time at this little-known destination for some of the best deep-sea fishing you will ever experience. There are very few experiences in life, only several fleeting moments in time when a person feels truly and utterly overwhelmed by awe and wonder. Going on a wild safari ranks very highly in that small number. Granted there are many safaris you can go on, the world over, but perhaps nowhere is quite as magical, as a Botswana safari or an Okavango Delta safari. It’s trips like these, that let you know how it really feels to become part of nature herself. So what makes these safaris so magical and truly memorable? Let’s find out! Lagoons, channels and islands make up this area of our beautiful planet, giving the untamed wilderness an enchanted sanctuary atmosphere. Every year floodwaters make their way from central Africa and transform the dry desert into an expansive wetland. The conditions and environment make it a paradise for a large selection of animals and wildlife. What could you hope to see on your safari? – Stunning flora which entices just as stunning game to the area throughout the year. – A wondrous and ecosystem where harmony rules, which can often be appreciated from an arial view with a flight between safari camps. – An inspirational selection of animals to see, from cheetahs to wild dogs and lions to hyena. Are you hooked already? Well just before you book your tickets, it’s time for a little trusty travel advice. Know Where You’re Going Before You Board The Plane! Botswana, or the Republic of Botswana as is it’s proper title, is a landlocked country, neighbouring countries are South Africa, Zambia, Zimbabwe and Namibia. Knowing the temperature and seasons in Botswana will help you to plan your safari trip for a time when you will be most comfortable. The Summer season runs from November to March and temperatures can be scorching. In general, you can expect a range of 19 – 30 degrees Celsius. The summer season also brings the rainy season, meaning clouds and downpours can be a common occurrence although they don’t tend to last too long. Winter starts in May and ends in August. Being the dry season, if you plan to visit during these months you won’t see a drop of rain. During the day the weather tends to be comfortably warm with spells of sunshine. Evening time can bring cooler temperatures, even dropping below freezing point. So Now I Know The Climate, But When Should I Book My Trip For? If this time of year interests you, then you can expect to be enthralled by vivid floral displays, perfect light for photos, and the odd exceptional storm. Since this is time for many animals to give birth to their young, it’s a keen favourite with many tourists. The sudden emergence of young animals also means predators are more active, so wildlife viewing can be excellent during this time. April and May often see safari camps beginning to offer both land and water activities, offering tourists the opportunity to really explore their surroundings. November also comes with a great benefit for bird-lovers. Summer bird migrants start to make their appearance to woe all who catch a glimpse of them. In addition, as the waters start to recede, birds of prey are busy making the most of the opportunity to do a spot of fishing. As the wilderness transforms into a wondrous wetland, many animals are on the move and adapting to their new surroundings. All of the wilderness activity gives plenty of enchanting moments for tourists to admire . Packing for a safari trip in Botswana varies significantly from packing for a beach holiday! Appropriate clothes are vital if you’re planning a trip during the Summer season then be sure to invest in a good quality rain coat and wet gear. In addition, you’ll need a good sunblock, protective sunglasses, a sun hat and comfortable walking shoes. Of course, be sure to take a visit to your doctor well in advance of your trip as various vaccinations or medicines may be recommended, including Malaria tablets. An obvious one of course, but don’t forget your passport! Botswana allows passports that have at least 6 months remaining before your departure date. Certainly, life is a journey and every step of the way should be enjoyed and cherished. If you really want a moment that will take your breath away, then consider planning a Botswana Safari trip. With such a vast amount of wildlife to see, a stunning ecosystem to admire and scenery that will truly leave you in awe, it’a trip you’ll be talking about for a long time to come. After all, where else could you feel that you really become part of nature herself? When it comes to finding the top bird watching locations, you are going to want to be sure that you do the proper amount of research in order to effectively do so. The good thing about this is the amount of different resources that you should have at your disposal to be able to do so successfully. There are plenty of different things that you can do in order to find the top 5 bird watching locations. Throughout this article, we will be dissecting some of the things that you can do in order to actually be able to find these locations. This is easily one of the best resources that you will be able to utilize for just about anything related to traveling. By using this resource, you should be able to find real feedback from actual travelers. This will ultimately allow you to be able to successfully figure out the things that you need to do in order to get to the different locations and it will also provide you with a good amount of tips on how to do so affordably. Not only that, but it will also allow you to figure out things that you should be able to do nearby as well. The good thing about this resource is the fact that they typically have all kinds of different lists and reviews on the different attractions and places nearby. Thus, you will not have to worry about finding a place to stay, a restaurant, or anything else. You can also visit the forums located on Trip Advisor’s website and/or mobile application and find all kinds of feedback from people that have traveled to the location as well. This will allow you to get personalized advice regarding your travels and adventures which can come in handy. Another great way to get excellent feedback and information on potential places to bird watch would have to be on personal blogs. By looking at other people’s blogs, you should be able to find all kinds of information that could potentially help you in all kinds of situations. By doing this, you are going to be able to really be able to narrow down your options and find the best possible bird watching locations to consider. Doing this is going to provide you with all kinds of information that you can use in order to really find great spots, find affordable locations, and come up with great strategies. Blogs will be able to provide you with the best details that can really help you on any kind of trip. This is especially true when it comes to doing things like bird watching as they should be able to provide you with actionable advice regarding which spots to travel to. In the end, you want to make sure that you are using all of the resources at your disposal to find the best possible locales to consider. St Lucia is situated around 240 kilometers from Durban South Africa and is a portion of the iSimangaliso Wetland Park its inlet has a large concentration of the crocodiles and hippos in southern Africa. Below are 5 of the best St Lucia boat cruises you can take advantage of. The area known as the St Lucia Estuary is known as the biggest estuarine system in the whole of Africa. This boat cruise includes a 10 kilometer cruise over a period of 2 hours. This particular cruise operates in peak season around 4 times daily. Bookings can be done through www.heritagetoursandsafaris.com. This cruise allows you to observe and witness, Nile crocodiles and hippos along with an extensive array of bird species. This two hour Safari on a boat cruise allows you to get extremely close to the residents in this estuary. This 15 seater vessel includes the Shoreline 1 and the Shoreline 2 accompanied by knowledgeable and experienced rangers and skippers. They are able to answer any questions you may have about the animals and the areas and offer you with incredible information and facts about this amazing location. This 4 hour excursion on board a private powerboat departs from Vigie Cove and covers a journey along the island’s Western coastline with your closest friends and family. This cruise allows you the choice to go snorkeling, fishing or whale watching and the private tours offer you with more flexibility as well as personal attention offered by the crew members. Some of the highlights of this cruise allow you to get off the boat and relax on the beautiful white sands of the beach or even take a swim in the aquamarine waters of the ocean. The boat offers an open bar with snacks, fishing equipment and snorkeling gear to guarantee a fantastic time. This cruise is offered on a catamaran by the name of Tout Bagay. The 8 hour excursion is provided by expert and professional crew and captain as your personal hosts. This tour offers you the opportunity to leave the boat and to explore sites such as the Morne Coubrail Estate that offers a zip lining adventure, Toraille Waterfall, the Sulphur Springs as well as the old fashioned and quaint town known as Soufriere. The tour comes with snorkel equipment that you and your guests can use to explore underwater areas of Marigot Bay and Anse Cochon. The spacious catamaran offers an extremely comfortable way to view some of the top areas in St Lucia as well as the Creole-style lunch at one of the famous restaurants. This private cruise offers coastal sites of St Lucia and is conducted over four hours on the Bertram power boat. This expert cruise offers sights of the majestic Pitons , Castries, Marigot Bay the town of Soufriere along with other interesting sites along the West Coast. The local crew offer commentary throughout the cruise and the boat stops off at one of the best known beaches were you are able to snorkel and swim among schools of vibrant fish and stunning coral. The round-trip transportation and refreshments from the selected hotels and cruise port are all included in your booking fee. This powered boat charter offers the best coastal sights and complimentary refreshments. One of the highlights of this cruise is that you can customize your itinerary to your own specifications. Eshowe, the oldest European town in Zululand, has a hilltop spot that overlooks the coast giving the area a feeling of tranquillity. The Dlinza Forest surrounds the town and causes winds to blow with a sound that mimics the town’s name. This is one of South Africa’s most naturally diverse spots. Tour Eshowe and see all the natural bounty it offers, then journey to the battlefields to walk in the footsteps of history. Visit the battlefields to walk on the very same grounds as military masters. The Battlefields route is huge and you can find various spots to check out using a map or by hiring a special guide. You can see the Big Five animals along with a myriad of birds, so the journey will take you not only through history but through nature. One nature preserve in particular to see is the Itala Game Preserve. If you are new to Eshowe, you can get the most from your visit by hiring a guide. They have the information you need to make the most of your battlefield tours. You might also employ the use of a guidebook or maps to trek the battlefield routes yourself, but this is recommended for more experienced travellers. From your accommodations in Eshowe, you can drive to the various battlefield sites you wish to see most. If you hire a guide, most will be able to drive you from where you are staying to your desired sites. If you decide to stay in Durban, there are even some guides that can pick you up from there. The battlefields require travelling on bumpy, gravelled roads, but they are all accessible by cars. You will want to avoid travelling during the rainy seasons unless you are experienced. The months of January and February can be the most difficult to traverse the sites and monuments by car or by foot due to heavy rain. There are many other sites to see nearby of the residences of various kings. Some of these were razed during the Anglo-Zulu war in the late 1800s by the British but have been rebuilt for visitors to explore. Indulge in the best of two cultures coming together after embroiling themselves in significant battles. To get the most out of your adventure, you will need to do some research before booking your trip. If you are not sure of which battlefields you must see, read through some guidebooks first. There is, of course, plenty of information online about the area. Most visitors realise quickly that there is more to do besides explore the battlefields when on them. Since there are many other experiences to have in Zululand, make sure to research them ahead of time. You can also consult with a travel agent to find out which tours appeal most to you whether you are a nature buff or a literature and history buff. Decide which battlefields you must see and then book your trip as well as your accommodations. If you want guided tours, these will also require some research before you depart for your trip. Select an experienced tour guide and you will ensure that you will see as much as possible on your trip to Eshowe and the surrounding area. Seeing the battlefields in Eshowe is an experience to be treasured and savoured moment to moment. Plan your trip now and get ready to see this part of the world with your own eyes. Your expert tour guides are ready to hear from you to help you get your trip started.